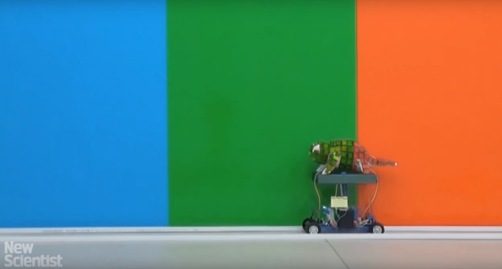 Soft bots; record-breaking North American robot sales; robots saving refugees; chameleon robot blends in with its surroundings; Robot Law and more. As robotic octopuses, caterpillars, starfish and other malleable machines come to life, some scientists have begun to focus on better ways to control the devices’ actions. “We’re talking about floppy, elastic materials,” says Kramer [a mechanical engineer at Purdue University in West Lafayette, Indiana]. “When something moves on one side, you’re not quite sure where the rest of the machine is going to end up.” That is why many applications will probably require extra sensors to monitor movement. Yet conventional position and force sensors — rigid or semi-rigid electronic components — don’t always work well with soft robots that undergo extreme shape changes. The prototype cost less than $100 USD to make and according to the researchers the cost could be brought down to around $10 through mass production. Now you see it, now you don’t see it as clearly. The key to this biomimetic technology is realising electrically driven actuation of broad reflection bands, which may be partially enabled by some of the existing ‘e-paper’ or ‘e-chem’ display approaches, including electrophoretic, cholesteric liquid crystalline, and electrowetting,” the researchers wrote. Light sensors recognise the background colour, which is then translated to the correct reaction. Link includes a must-read free chapter from a new book entitled Robot Law, editied by Ryan Calo, A. Michael Froomkin and Ian Kerr which covers many of the legal issues around emerging robot technology. we might soon be witnessing a personal robotics revolution. These systems have the potential to revolutionize our daily lives and to transform our world in ways even more profound than broad access to the Internet and mobile phones have done over the past two decades. We need to be ready for them and, in particular, we need to think about them in the right way so that the lawmakers can craft better rules for them, and engineers can design them in ways that protect the values our society holds dear. But how should we do this? A da Vinci medical robot at a UK hospital operated on its 500th patient recently. The 500th patient, prostate cancer sufferer Paul Daley, 58, chose robotic surgery over non-robotic options. He said: “I decided to go for robotic surgery after looking at all the models of treatment. I’m glad I went for it. Here it is mainly used for prostate surgery, the robot was installed in 2011. A robot designed by U.S. researchers is being used to help migrants in distress in Greek waters. Dubbed Emily (Emergency Integrated Lifesaving Lanyard), the remote-controlled robot is a 25-pound, 4-foot-long, red flotation device on jet skis and is used by the Greek Coast Guard. Here’s how “Emily” might be put to work helping migrants: An operator in a remote location would send the robot, which can travel at a speed of 20 mph, out to migrants struggling in the waters off Lesbos. Up to five people at a time can grasp onto the 4-foot-long flotation device tethered to a 2,000-foot-long rope, which rescuers could then manually reel in. Helicopter drones also tethered to ropes can send back aerial images of the rescue in real time to help operators best manipulate the robot. Adopting automation can lead to higher overall wages, the creation of new jobs, and –in the case of cobots– could lead to extended working lives, according to this piece in The Telegraph. Citing Polanyi’s Paradox, Patrick Schwarzkopf, managing director of Europe’s Mechanical Engineering Industry Association VDMA, argues that robots are unlikely to take over entirely. Mr Schwarzkopf also forecast a 15pc annual increase over the next four years in demand for robots as countries race to automate manufacturing.